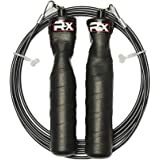 Rx Jump Rope - Black Ops Handles with Trans Black Cable Buff 3.4 9'0"
5.0 out of 5 starsRecommend!! 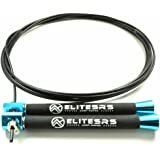 I bought this item for Crossfit for DU's and it is well worth the money!! 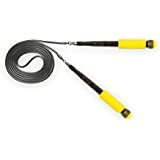 It helped with 17.5 I was able to do more du's than ever before, it is Fast but with that it does leave a mark as mine doesn't have the coating, but I prefer it more than any other ropes I have tried. 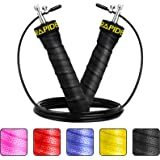 Perfect speed rope for Crossfit. Very lightweight and easy to handle. 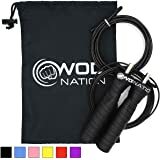 This rope has really helped me master double unders. 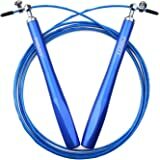 One of the best jump ropes out there. It is light and the speed of the rope is awesome. 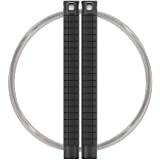 The price is on the higher side, but the material looks durable and should last for a while. Definitely recommend it. Well... 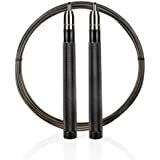 I jump rope 15-20mins 3 times a week and it snapped in half after 3 weeks of use. 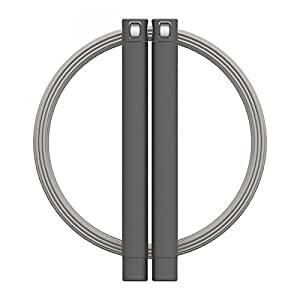 wow... before you guys decide to buy, make sure you don't use it outside in the concrete!! I saw sparks on the ground when I speed up my pace, it's crazy! 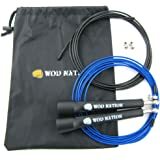 I guess it's okay if you're using it in a gym or some place where the ground is smooth, but avoid concrete at all cost if you guys decided to buy this. Other than that, the rope is really good. It is like an extension of you. I guess I'll get a different kind, the kind where I can use it outside in the concrete.